Transformational Breath® deepens our understanding that how we breathe is an indicator of our physical, emotional and spiritual health. It clearly has an impact on our quality of life. By breathing consciously, even for just short periods of a time, our perceptions are permanently broadened and altered. That is, even when things don’t go our way our view of them affects how we move forward with less stress. 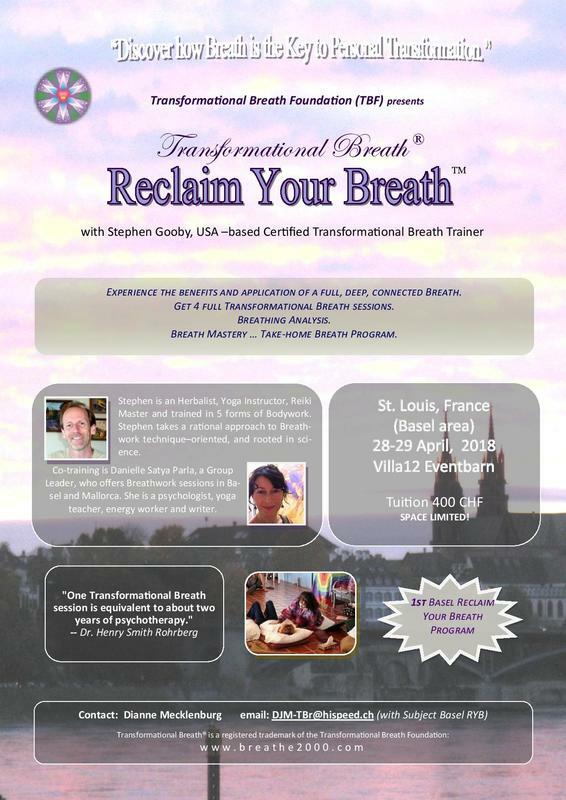 The invitation is for you simply to Reclaim Your Breath and take the opportunity to actively use the self-healing tools available through Transformational Breath®. There are aspects of your life, you will learn, that can affect you unconsciously. It is possible for those aspects surrounding physical trauma and negative emotions to be released and integrated. This brings you into better holistic health and connection to that which is greater than yourself. Indeed, altering breath patterns can alter mental and emotional states. Research suggests that we can change our chemistry, outlook and attitude by changing the flow, depth and rhythm of our breathing. Be introduced to 3 main concepts: diaphragmatic-deep breath inhalation, connected breath and relaxed exhalation. Learn and experience the physical, emotional, mental and spiritual benefits of bridging the relationship with your breath. Learn how movement, toning and touch can be used to open the breath. Experience two daily breathing sessions - providing an incredible opportunity for deep activation and integration of trauma and blockages. Integrating Transformational Breath® into daily life (just moments at a time) can help you change old breath patterns and address breathing problems. It is for all people, all ages, all cultures and gives access to the vitality that is part of gaining new insights and more understanding about yourself. No prerequisite with breathwork or Transformatioanl Breath® Trainings. Led by TBF Trainers and Co-Trainers. An immerse weekend provides you with the confidence to continue your practice at home. Training is in France (about 1km from the Swiss border and the city of Basel). Stephen Gooby is an Herbalist, Yoga Instructor, Reiki Master and trained in 5 forms of Bodywork. He takes a rational approach to Breathwork technique–oriented and rooted in science. Danielle Satya Parla is a Psychologist, Yoga Teacher, Energy Worker, and Writer. She offers Breathwork workshops and 1-1 and group sessions in Basel and Mallorca.